A chubby young girl with Pippi Longstocking braids stands in front of the mirror holding up a too-small pink dress and sees a different version of herself. Her mirror image is thin. It's the cover of a (disturbing) new children's book. A chubby young girl with Pippi Longstocking braids stands in front of the mirror holding up a too-small pink dress and sees a different -- some may say better -- version of herself. Her mirror image is thin. 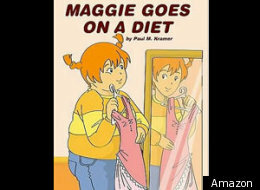 No, this is not an after school special on eating disorders; it's the cover of a (disturbing) new children's book with the (possibly more disturbing) title, Maggie Goes on a Diet. And, this will be in bookstores October 16. Barnes & Noble recommends the book to children aged 6 to 12. In the land of hypothetical, there could be some rationale behind the plot. Disturbing, yes. Surprising? With infant's onesies that were selling for $23.95 that read, "Nothing tastes as good as skinny feels," unfortunately not.